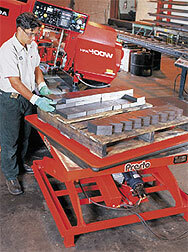 Many worker injuries result from repetitive lifting motion caused by bad ergonomics. Cisco-Eagle can help you remove the bad ergonomics in your operations by recommending lift equipment that suits the task at hand. Whether it's loading and unloading pallets or transferring goods from the conveyor to packaging, there's an ergonomic way to get the job done so that workers stay healthy and uninjured. We have the scissor lifts, cranes, hoists, manipulators and end effectors that lower operating costs, improve safety and increase productivity. Let us offer some ideas - give us a call or fill out the form to the right today. Jib cranes from Gorbel, Zimmerman, Spanco, and more allow you to adjust rotation, add end effectors and choose power options, capacities, heights and spans to meet your needs.